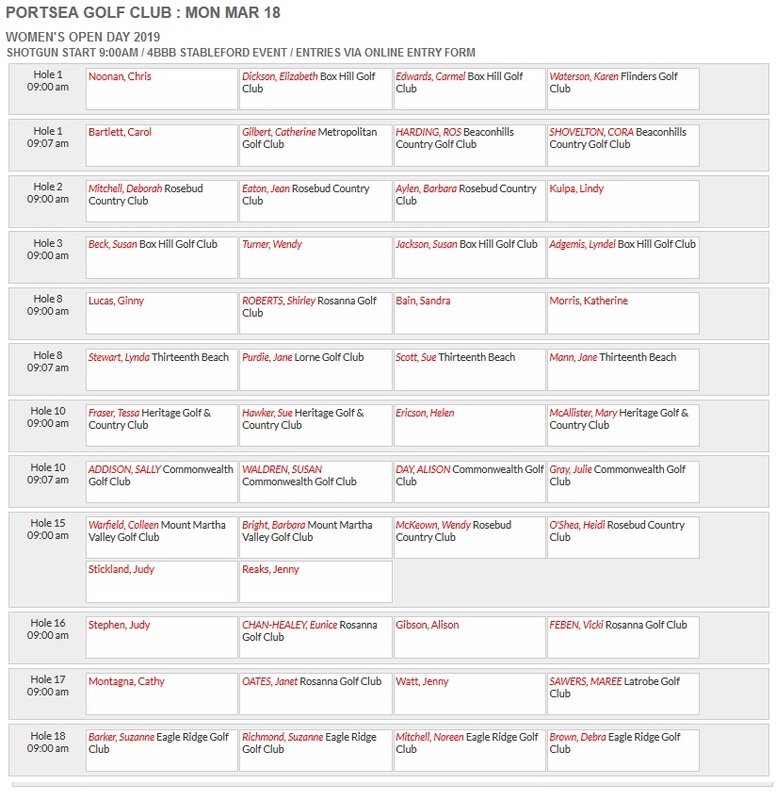 The draw for the 2019 Women’s Open Day to be held on Monday March 18th 2019 is available below. The day is a 4BBB Stableford event with a 9:00am Shotgun Start followed by a 2 course lunch. Any queries please contact Golf Operations Manager Simon Risstrom on (03) 5981 6155 or via email at golfoperations@portseagolf.com.au. 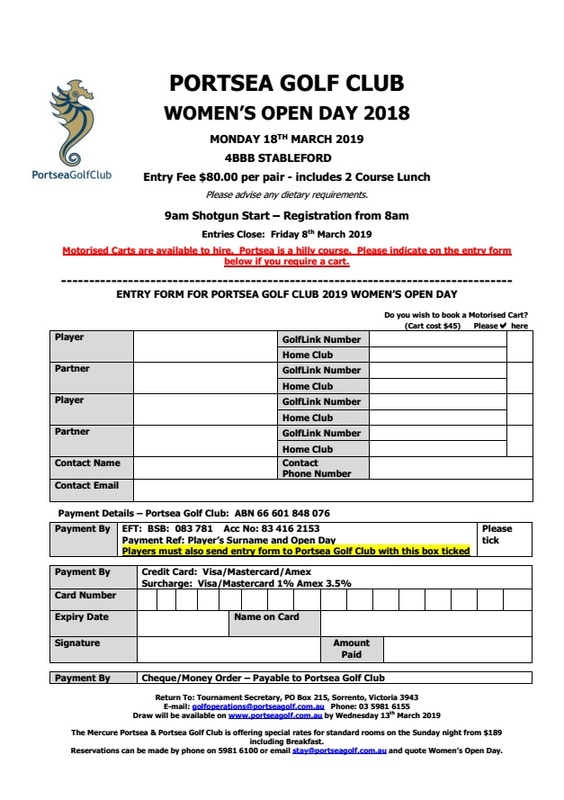 The 2019 Women’s Open Day will be held on Monday March 18th 2019. The day is a 4BBB Stableford event with a 9:00am Shotgun Start followed by a 2 course lunch. The entry fee is $80 per pair which includes Lunch. Entries Close: Friday 8th March 2019. Motorised Carts are available to hire. Portsea is a hilly course. Please indicate when entering if you require a cart. Cart Hire is $45 per cart payable on the day. 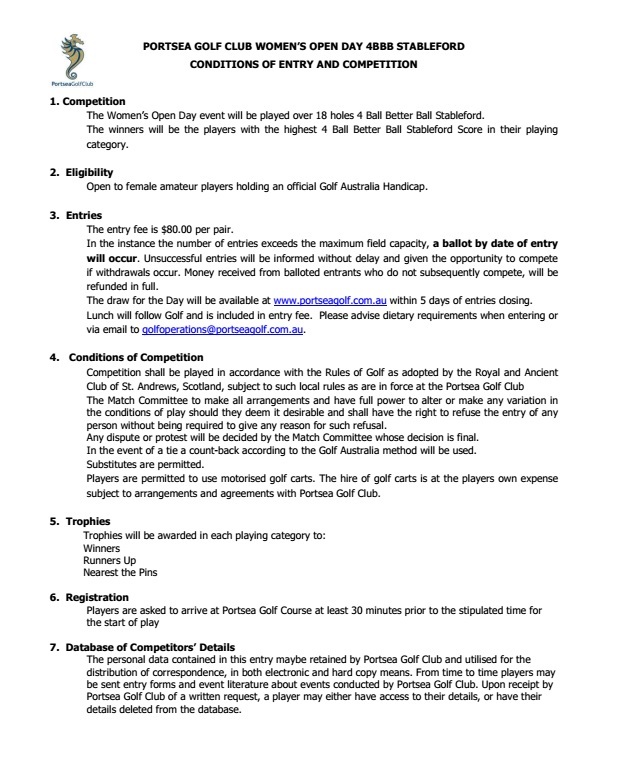 Draw will be available on www.portseagolf.com.au by Wednesday 13th March 2019. The Mercure Portsea & Portsea Golf Club is offering special rates for standard rooms on the Sunday night from $189 including Breakfast. Reservations can be made by phone on 5981 6100 or email stay@portseagolf.com.au and quote Women’s Open Day.